Welcome to the website for the Möbius Initiative. Here we showcase some of the exciting projects in which Gustavus faculty and students are collaborating across disciplinary boundaries. The Möbius Initiative takes its name from the Möbius strip, a continuous curve with only one side; with this name we celebrate the breaking of disciplinary boundaries that characterizes the liberal arts tradition. You can read more about the initiative in JJ Akin's article. Join us at the Möbius events listed below, and consider submitting a proposal for your own Möbius project. History, Biology, and Eugenics/Genetics: Teaching and Learning Across the Disciplines: Professors Maddalena Marinari (History) and Laura Burrack (Biology) talk about the challenges and rewards of their innovative collaboration in spring semester 2018 teaching a course that combined their interdisciplinary perspectives, methods, and pedagogies. 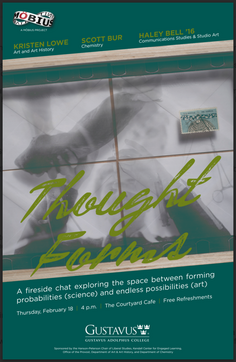 Thought Forms: a fireside chat by Kristen Lowe (Art & Art History), Haley Bell ’16 (Communications and Art Studio) and Scott Bur (Chemistry) exploring the space between forming probabilities (science) and endless possibilities (art). Prof. Lowe and Haley Bell participated as artists-in-residence in Prof. Bur’s Organic and Synthetic Chemistry research. Read about their unique collaboration and view examples of their work in the following news story. 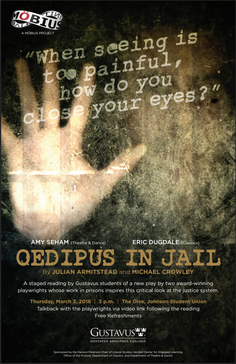 Oedipus in Jail: a staged reading by Gustavus students of Oedipus in Jail, a new play by Julian Armitstead and Michael Crowley, two British playwrights whose work in prisons inspires this critical look at the justice system. The playwrights participate via live video link in a talkback afterwards. Directed by Amy Seham (Theatre and Dance) and Eric Dugdale (Classics). Read about the play and the event in the article by Kim Krulish in the Gustavian Weekly. 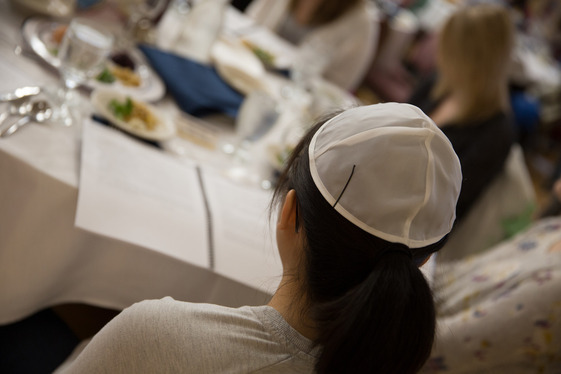 Celebrating The Passover Seder: this educational campus-wide Seder offers an opportunity to experience a nearly two-thousand-year-old tradition that has deep significance for Jews and many Christians. Organized by Marian Broida (Religion), the Seder incorporates song, readings, a delicious meal, and a traditional game. Casey Elledge (Religion) talks about the significance of Passover in the New Testament and Christianity, and ways in which some modern Christian denominations have celebrated Passover. Read about the event in the article by Megan Eide. 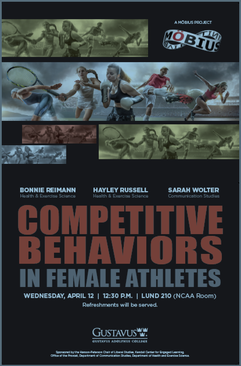 Competitive Behavior in Female Athletes: Bonnie Reimann (Health & Exercise Science), Hayley Russell (Health & Exercise Science), and Sarah Wolter (Communication Studies) present their collaborative research on competitive behavior in female athletes, examining types of competitive behaviors, contexts in which the behaviors occur, and ways in which players display them. 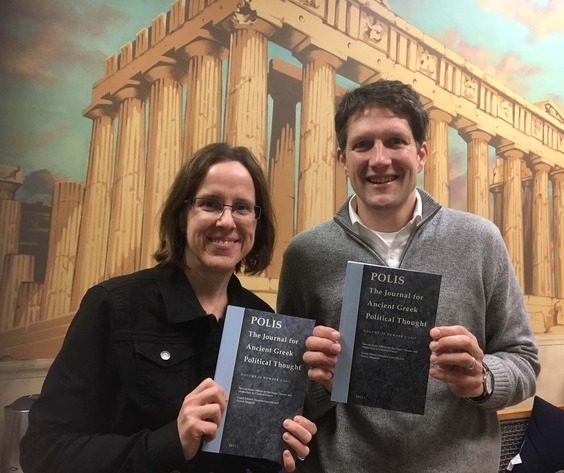 Forms of Justice in Aeschylus' Eumenides: Mimi Gerstbauer (Political Science) and Eric Dugdale (Classics) collaborated on an article titled "Forms of Justice in Aeschylus' Eumenides," published in Polis, the journal for ancient Greek political thought (Polis 34:226-250). In this article, they explore the different forms of justice presented in Aeschylus' Eumenides and examine the resolution of the conflict in the post-trial phase of the play in the light of principles and practices of modern restorative justice. In closing, I would like to acknowledge the support of the Kendall Center, the benefactors of the Hanson-Peterson Chair in Liberal Studies, and the Provost’s Office.